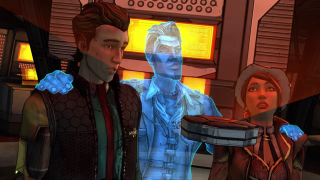 Telltale Games has broken its tradition of making its episodic games five chapters long with Game of Thrones, but Tales from the Borderlands sticks to the five-episode format and that means that the next episode will be its last. As Telltale just tweeted, that finale will be released on October 20, just over two weeks from now. This trailer looks like it's about the first episode, but that's just because episode one is now available for free on consoles and mobile. It's actually a teaser for episode five, called "The Vault of the Traveler". Telltale Games is busy this month. A week before episode 5 of Tales from the Borderlands comes out, Minecraft: Story Mode is released. How soon before Telltale has fingers in all the pies, making episodic games in every video game universe there is? Where will they go next?